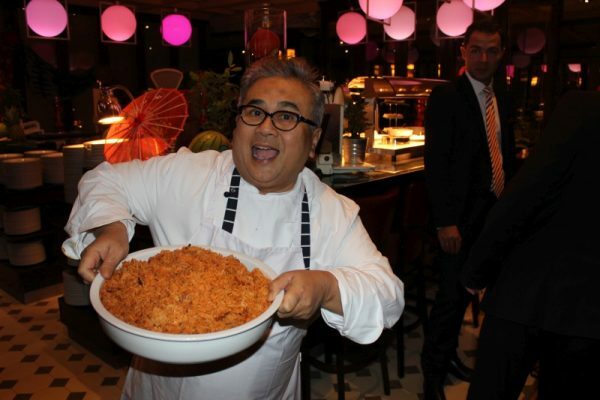 Once again, Malaysia’s Dato’ Chef Ismail will be rocking Frankfurt with his art of cuisine. From 19th to 21st of October there will be a Malaysian Food Promotion at the Marriott Hotel in Frankfurt. Organised by the Malaysian Consulate General and the Malaysian Club Germany (MCD) in collaboration with Marriott, there will be an exciting, traditional Malaysian menu prepared by Chef Ismail and Chef Thomas of Marriott. Uwe Fischer of MALAYSIA INSIGHTS had the chance to interview the VIP chef. Dear Chef Ismail, you have officially been assigned to represent your country as a tourism advisor which is an honour that you share with only very few other Malaysian celebrities. Has that distinction and the duties connected to it affected your life a lot? No. Actually, there is always a reason why you are chosen. I think, before that I was also a kind of ambassador for the country, especially for the gastronomy. I was always traveling, talking, drawing, cooking, acting and telling the world about the culture, the taste and the magic of the gastronomy of Malaysia. What would you say is your reputation or your speciality as a chef? I think I am perceived as a heritage chef of Malaysia. I believe, when you put things together, especially the ingredients, even though they have modernised the technique of producing, they shouldn’t lose the authenticity of it. So, I fight for heritage. Just last year, I published another book on Malaysian heritage food, my third one. I understand you are very busy with travelling nowadays, do you feel you still have enough time to cook? Yes. What I do is, wherever I’m travelling I bring my own pots and pans. So, even if I’m cooking in Germany, if I bring my pots and pans and ingredients along with me, I just feel like cooking at my home. …so, you are already used to Germany. I guess? Yes. I am used to Germany and I know the palates here and I also know the ingredients. I believe when people travel, food travels along. When Germans or other foreigners go to Malaysia they always go back home with memories. And then, when I come to Germany, they will say, “Aaah! Malaysian food promotion is in town! Let’s go!” Likewise, if there is some great German food promotion or whatever in Kuala Lumpur, I’d definitely go and try. That means, you also like German food? Yes. I like the heritage one. In fact, sometimes I do miss German foods. Dear Dato’, thank you for this interview. Jimmy Low - who has written 38 posts on Malaysian Club Deutschland.